At the end of May, Exelon, the owner of the Three Mile Island Nuclear Generating Station in southeastern Pennsylvania, announced its intention to retire the plant in 2019 unless the company is given assistance by the state to help keep the plant financially viable. Exelon’s announcement marks the sixth announced nuclear retirement in the past seven years. Currently, 99 nuclear reactors at 60 nuclear power plants operate in the United States. Since the first commercial U.S. nuclear reactor came online in 1957, more than 30 nuclear reactors have retired. Some of these retired plants were test projects or experimental designs, but most provided commercial power for some portion of their operational lives. Prior to the retirement of the Crystal River, Kewaunee, and San Onofre nuclear power plants in 2013, no nuclear reactor had been retired since 1998. Since 2013, two more plants—Vermont Yankee in 2014 and Nebraska’s Fort Calhoun in 2016—have retired. In total, the five nuclear plants that retired in the past four years had a combined capacity of nearly 5,000 megawatts (MW). In most of those cases, increased electricity generation from natural gas and coal made up for the reduced nuclear output in the months following nuclear plant shutdowns. In addition to these recent retirements, six plants are scheduled to retire within the next nine years. 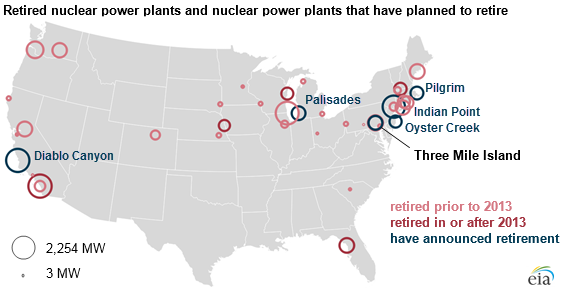 Four of these—Palisades, Pilgrim, Oyster Creek, and Three Mile Island—have planned retirement dates more than a decade before their operating licenses expire. New nuclear plants are licensed to operate by the Nuclear Regulatory Commission for 40 years, but nearly 90% of currently operating nuclear power plants have applied for and received license extensions to operate for another 20 years. Entergy, the owner of Indian Point, had initially applied for a license extension for the plant. When the extension was challenged by the state of New York because of environmental and safety concerns, Entergy announced its decision to retire the plant. Pacific Gas & Electric, the owner of Diablo Canyon, chose not to seek a license extension, and the company now plans to retire the plant by the time its license expires. Economic factors have played a significant role in the decisions affecting the continued operation or retirement of nuclear power plants, as increased competition from natural gas and renewables has made it harder for nuclear generators to compete given slowing electricity demand growth. In the announcement of its plan to retire Three Mile Island, Exelon noted that the plant had not been profitable for the past five years, and they sought subsidies from Pennsylvania to provide the financial support necessary to keep the plant open. New York and Illinois have already enacted programs to provide financial support to selected nuclear plants. Those programs are currently subject to legal challenges that have yet to be adjudicated. The 2017 EIA Energy Conference, held June 26 and 27 in Washington, DC, will examine current trends and key developments affecting energy at the state, national, and global level. Conference registration is open through noon Eastern Time on June 22, 2017.